The issue of moving children out of state either before or after your marriage ends is such a hot button that the federal government has drafted legislation to address it. The Uniform Child Custody Jurisdiction and Enforcement Act regulates which state has jurisdiction over custody issues if a child moves. States have their own individual laws as well. Although they vary to some extent, you generally can’t move with your kids across a state line without the express written consent of the other parent or a court order. Some states specifically prohibit moving your child across state lines and others base their laws on geographic distance. For example, if you live in Wisconsin, you can’t relocate your child more than 149 miles away from his other parent’s home. In either case, you must either have the written consent of the other parent or file a motion asking the court to allow you to move. If your child’s other parent strenuously objects, this could require a full-blown trial. 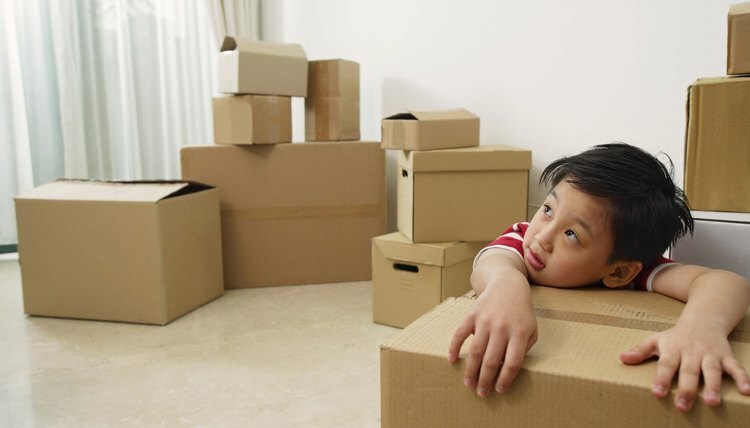 Generally, you would have the burden of proof to convince the court that your child will benefit from the move. Whether your move is 150 miles away or five miles across the state line from New Jersey to Pennsylvania, the court is likely to disallow it if you don't have a good reason and if it grossly interferes with your child’s relationship with his other parent. For example, if he has historically enjoyed visitation with his other parent every weekend, and if you move from New Jersey to California, the move would probably diminish their relationship to a very great extent. Your child might only see his other parent for a few weeks in the summer and on extended school breaks; he’d lose close, frequent contact with him. If you want to move only 40 miles across a state line, the court would be more likely permit the move because it would not have such a great effect on the parent/child relationship. Likewise, if your custody arrangement is such that your child only sees his other parent once a month, a long-distance move would have less of an effect on their relationship. The parent who wants to move generally has the burden of proof to convince a judge that it will benefit the child. This is difficult, but not impossible. If your move is to accept a job where you’ll earn an additional $50,000 a year, that would benefit your child. If you want to move to Florida because you enjoy the beach, the move benefits you, not your child, and a judge would probably rule against it. You can increase your odds of success if you can show the court how and why your child will be better off after the move. You’re also more likely to receive court approval if you can provide a detailed schedule showing how your child and his other parent can maintain close contact despite the move. The more positive information you can give the court regarding your child’s new neighborhood, the more likely it is that the court will approve your move. Provide documented information regarding his new school and any social activities that will be available to him. If you’re successful with your motion to the court, and if you move some distance away, be prepared to foot the bill for your child’s travel expenses to visit his other parent. Most judges will require this of you. No law can prevent an adult from moving if she wants to. If you were divorced in Florida, you can pack up and relocate any time you like -- but you may not be able to take your children. Florida’s laws regarding the relocation of children away from their other parent are specific. You can’t move beyond 50 miles without the express consent of either your spouse or the court. When parents share parental responsibility, the state of California prevents the custodial parent from relocating with a child without either the consent of the non-custodial parent or a court order. This restriction may make it difficult for the custodial parent to take that dream job in another state. However, the prohibition's purpose is to protect the relationship between the child and non-custodial parent by ensuring the non-custodial parent does not suddenly become unable to see his child. Massachusetts is one of the few states that allows a child to say whether he is willing to move to another state, provided he is old enough to reasonably give consent. However, if the child is not old enough, you must get the consent of the other parent or permission from the court to move your child to another state. A judge will base the decision on the circumstances surrounding the proposed move, such as the custody arrangement, parent-child relationships and effect the move is likely to have on the child.